An analysis of the nature, causes, and significance of violence in the second half of the twentieth century. 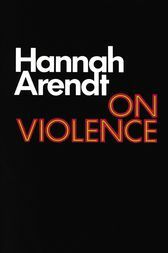 Arendt also reexamines the relationship between war, politics, violence, and power. “Incisive, deeply probing, written with clarity and grace, it provides an ideal framework for understanding the turbulence of our times”(Nation). Index.